Director: Sam Raimi. Cast: Tobey Maguire, Kirsten Dunst, Alfred Molina, James Franco, Rosemary Harris, J.K. Simmons, Daniel Gillies, Dylan Baker, Donna Murphy, Elizabeth Banks, Bill Nunn, Cliff Robertson, Willem Dafoe. Screenplay: Alvin Sargent (based on a screen story by Alfred Gough & Miles Millar and Michael Chabon, and on the comic books and characters by Stan Lee and Steve Ditko). Spider-Man 2 is beautifully production-designed by Neil Spisak, a veteran of several Michael Mann movies who seems to relish the chance to lavish gleaming cityscapes with details and color. As photographed by Bill Pope, sprung at last from the joyless color palettes of the Matrix trilogy, Spider-Man 2's New York City is even more pleasantly confected than in the first Spider-Man. The colors are so vibrant, in perfect tribute to the comic-book medium, that you feel as though a too-close brush with the movie screen might streak your clothes with swaths of red, yellow, and blue. Toss in the fact that all of this luscious scenography has been much better integrated with the CGI work on Spidey himself, plus the lingering irony that the city looks sprightlier than ever just as Spidey himself is feeling glum and exhausted, and you seem to have the ingredients for a better, brighter sequel all around. But if you ask me, the lightning that struck for so many of this summer's sequels fails to ignite Spider-Man 2. The franchise remains, for me at least, a tolerable proposition tolerably well-executed. There's an annoying over-literalism to director Sam Raimi's approach to all of his recent movies. It is doubtful that A Simple Plan or The Gift could possibly have been more dourly and howlingly obvious than they were, and it's a good idea in general for Raimi to squat in the comic-book universe, where archetypal distillations of psychology (as opposed to, say, credible personalities) are actually something of an asset. 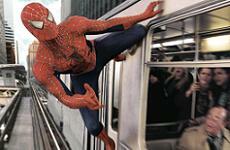 His Spider-Man films have a verve that the other films lack, but somehow, that verve never becomes enveloping. The Spider-Man movies remain stuck to the screen, enjoyable but wholly two-dimensional, and frustrating whenever they try to project bigger emotions, trickier conflicts, or nimbler craft than they ever really furnish. Alvin Sargent's scripts are often pretty good at laying out psychological ambivalence, especially among people who are supposed to love each other and know each other well. But while the right direction can spin Sargent's gifts into honestly compelling drama (as in Alan Parker's formidable Shoot the Moon), the wrong direction can make them seem soft or underpowered. Fred Zinnemann tried to let the safety/courage and friendship/honor dichotomies in the Julia screenplay do all their own work, while he set himself to gussying up the right historical mise-en-scène and hammering in on his professional actors. The result was just shy of a total mess, with Jane Fonda forced to project an undercooked character in an endless series of vague close-ups, and everyone else (save for the freestanding brilliance of Vanessa Redgrave) forced into reactive support around a character who wasn't there. Spider-Man 2 also has a network of dichotomies to sell, principally Peter Parker's lonely life as a hero and the constant push-pull between the remarkable individual and his suffering relationships with, to use an Alvin Sargent phrase, more ordinary people. This script's strategy for bringing home these conflicts is to recycle them over and over, in embarrassingly direct language, so that nearly every character in the movie is stuck with a monologue or two that reminds us of themes that are barely weighty enough to qualify. Being a hero involves some sacrifice, and all that, though after all the work-up, the end of this vehicle sure makes super-powered heroism seem like an okay way to live. (For one thing, it gives you immortal resistance to the laws of nature, so that even if a nuclear vacuum created by a fission experiment gone awry is sucking taxi cabs a mile or two away, you and your girlfriend can stand next to it and just, you know, grab onto something.) The most plausible explanation for all of Spider-Man 2's beatific speechifying is that everyone around poor Peter is trying to put him out of his misery and gently confide that they've already figured out his big secretbut then, this possibility gets scuttled by the big payoff scenes where all these characters are supposed to find out.